The international children's festival «Underwater world» has already in the fourth time opened the doors for young sportsmen and photographers, poets and artists. This year about 8 thousand children from Russia and the near abroad countries: Ukraine, Kazakhstan, Belarus have taken part in creative competitions. In high-speed kinds of underwater sports and diving children from Kharkov, Saratov, Lytkarina of Moscow Region, Zarechnogo of the Penza region and, certainly, Saransk competed. By the way, competitions on children's diving were spent for the first time to Russia. The festival has taken place thanks to support of Administration of the Head of Republic Mordovia. Organizers of the festival are: the Ministry of physical training, sports and tourism of Republic Mordovia, the Management of Federal Agency of the Russian Federation under the control over a drug trafficking on Republics Mordovia, the Mordovian salvage and rescue service of the Ministry of Emergency Measures of Russia, sport school of P.G.Bolotnikova, «The Palace of Sport», sport centre "Mordovia", school of №3 of Saransk, "KinoMaks - Pobeda", the Mordovian republican public children's organisation "Dolphin". 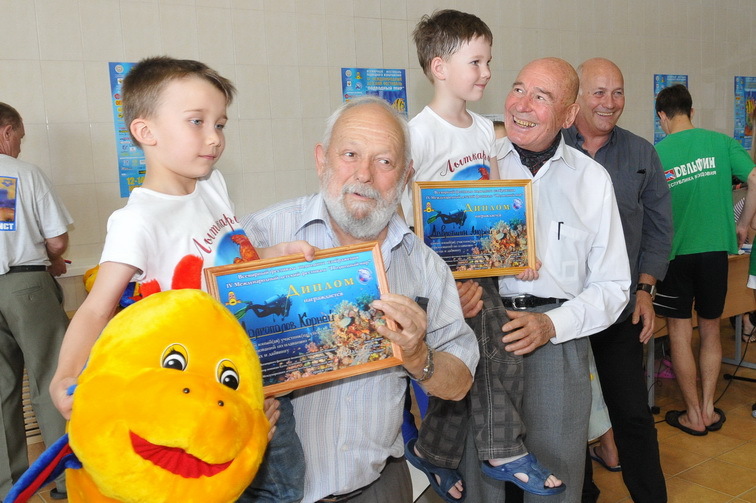 For the fourth time the visitors from France, who had already become good friends for Saransk children, were honorable members of jury of the festival: Daniel Mercier (the founder and the chairman of the World festival of the underwater image in the city of Antibes of France, the honourable chairman of the European confederation of professional underwater instructors), Andre Laban (the video operator of the command of Cousteau, the known artist, the writer) and Vladimir Ljutov - the president of the International festival of underwater films "AkvaFilm" from St.-Petersburg. For the first time our festival was visited by Christian Frasson – the known journalist, Daniel Mercier 's assistant. He enthusiastically responded about the festival and, as he said, he was completely fascinated by it. In the morning on May, 12th at railway station of the city of Saransk of visitors of festival were hospitably met with bread-salt by girls in the Mordovian national suits. Then press conference of visitors has taken place in the Republican House of the press.There were all leading regional mass-media representatives. 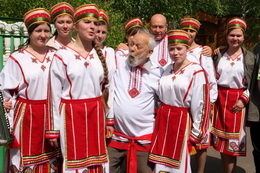 The guests underlined the uniqueness of the festival spent in Mordovia. Daniel Mercier and Andre Laban have thanked the organizers of the festival for their huge work on attraction of children to playing sports and development children's creative abilities. At the entrance of the Republican Palace of Culture the visitors were met with the Mordovian folk music by ensemble "Torama". Meeting relay race is accepted by children's folklore ensemble "Govorushki": with bread-salt and under fervent chastooshkas of own composition they lead the guests to the opening of an exhibition of the creative competitions. And gripping show appeared at eyes of spectators: the exhibition of drawings stretched more than on 30 metres! And 4-5 years old kids, pupils of the FINE ART STUDIO "Rainbow" of the Palace of children's creativity sat at tables and drew inhabitants of mysterious sea depths on an enormous sheet of paper. 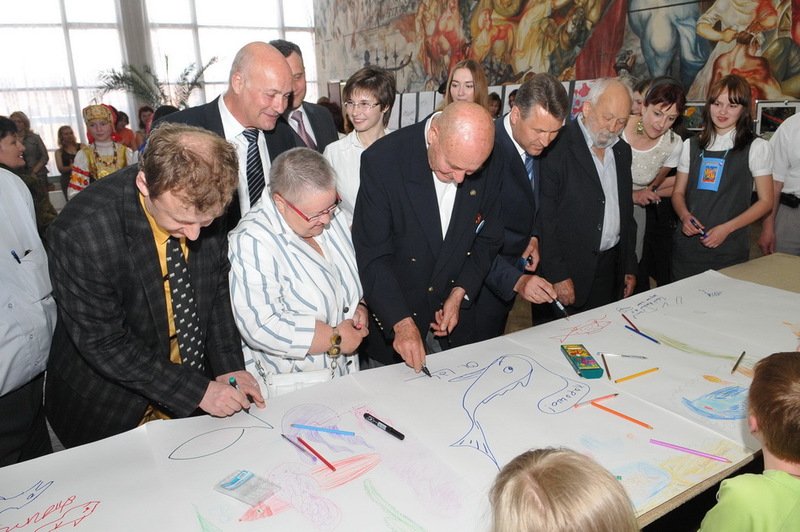 They transferred the felt-tip pens to the visitors with the request to finish the overall picture. Each visitor drew the small fish and put the autograph. At the poetry station the winners of this competition Ilja Kireev and Roman Kovalev read verses of own composition, it was so good that the jury asked to repeat their performance on the festival closing. The exhibition a children's underwater photo became one more informative station popular among young fans of the underwater world. Picturesque cloths of Andre Laban executed in the blue tones, truly reflecting all beauty of bewitching depth became the highlight of the opening. Under an applause of more than thousand spectators the visitors entered into the hall. Light dies away, the curtain rises and there all understood that surprises are not finished yet! On the stage there are huge shone fishes, jellyfishes, crabs. In full darkness they executed the hypnotising dance under the music attracting in sea depth. All hall as though came into the fantastic underwater world. This dance was so bewitching that Daniel Mercier invited all dancing collective and their leader Vyacheslav Tuzhilkin to the World festival of underwater images to France. The senior assistant of the Head of Republic Mordovia Nikolaj Nikolaevich Shchukin on behalf of the Head of Republic Mordovia Nikolaja Ivanovicha Merkushkina congratulated all on the beginning of festival and wished success to its participants. Besides he transferred the gratitude papers from the Head of Republic Mordovia toDaniel Mercier, Andre Laban, Vladimir Ljutovu, Igor Potapov and Lydia Bulycheva . About the bridge of the big ship. And they dream about the far seas. Rhythmical chords of live music in execution of collective the Big-band "Saransk" were energetically powerful support of the concert of the opening of the festival. 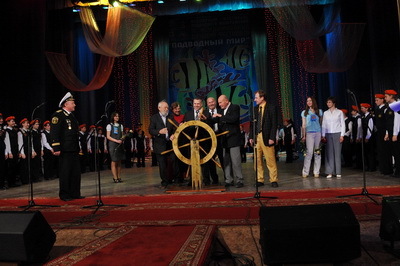 At the command of the captain of the first rank L.V.Dydykina, sea cadets together with guests of honour steering wheel turn having started festival "ship" in swimming! The second day of the 4th International children's festival «Underwater world» came. In the morning in sport centre "Mordovia" competitions on high-speed kinds of underwater sports and competition on diving passed. The festival heat united boys and little girls of different cities. Victories were promoted by unusually "easy" water this competitive day and support of heroic submariners of Daniel Mercier and Andre Laban was felt.the youngest participants of competitions - two 5 year-old sportsmen from Lytkarino of Moscow Region were awarded with special prizes. After solemn opening, salutatory words and wishes of the visitors of the festival the signal to start the competitions was given. Heats on swimming in bipalms and monopalm were the first kind of the sport program. The basic struggle was developed between sportsmen from cities of Saratov and Saransk. In heavy and persistent struggle the children from Saranskby won by quantity of prize-winning medals. The competitions on children's diving passed for the first time in Russia within the limits of our festival. The discipline purpose “Diving - the combined swimming of 300 m” consisted in distance overcoming for the least time in the base complete set of equipment (scuba) with use of a scuba diving, swimming in palms and divings at length. The participant floated under water to a mark of 10 metres, using at breath air from a cylinder. Removed and left on this mark the complete set scuba. To 25 metre marks (i.e. pool walls) the participant floated under water on a breath delay. Then passed to breath by atmospheric air and floated a surface distance of 75 metres. Having reached 100 metre marks, dived 10 metres to the complete set scuba left on the bottom, put on it, having passed to breath by air from a cylinder. Passed the remained underwater part of a distance of 190 metres, finished. Along toward evening have been summed up four creative competitions: video films, poetry and prose, a photo and the fine arts. Rewarding of winners in creative competitions (video films, poetry and prose, a photo and the fine arts) took place in cosy conditions of club "Victoria" in the afternoon. The honourable chairman of jury of festival Daniel Mercier selected 6 drawings of 300 picturesque and graphic children's works for participation in the World festival of the underwater image in France and handed over to two of them special prizes: Ljubavtseva Tatyana (Saransk) and Zaripova Irina ( Mezhgore, Transbaikalie). The creative collective of New Yenisei Children Art School from Lesosibirsk was awarded with the special prize of festival for a cartoon film «Underwater imaginations». 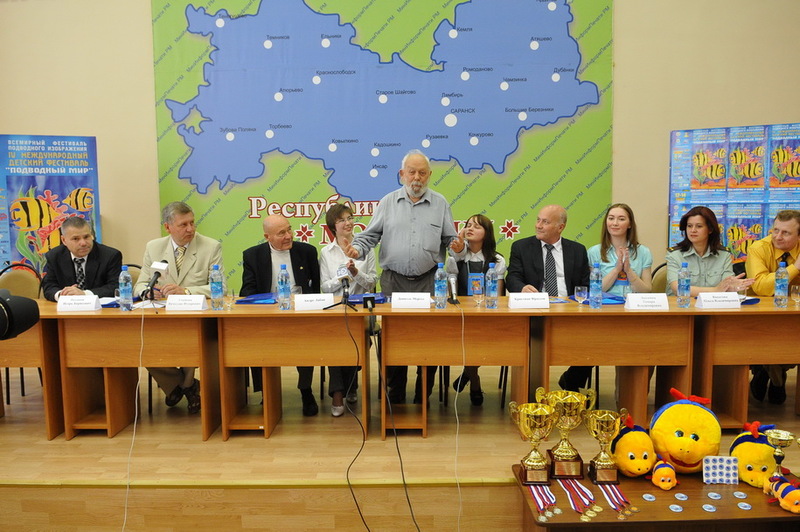 In poetry and prose competition «the sharks of a feather» were defined. The first places were occupied by Ilja Kireev (school № 12 of Saransk) and Roman Kovalev ( school № 29 of Saransk). In competition of underwater photo: in the nomination «Production shot» the winner was Roman Stoyanov (Kharkov, photowork "Comet"), in the nomination «Open water» - Oleg Potapov (Saransk, photowork «the Thoughtful crab»). At festival winners of "the Prize of spectator liking» were defined: competition of graphic creativity was won by Ljubavtseva Tatyana with drawing «Sea photographer» (Children’s School of Art №1 of Saransk), in competition of instant drawing the best became the work of two schoolgirls of 4th lycee of Saransk - Arapova Angelina and Tidjakina Margarita. The drawing art competition was the most mass competition of festival. Its geography was stretched from island Sakhalin to the coast of Black sea. Among the Russian regions many works d from Saint – Petersburg and Leningrad region, the Nizhniy Novgorod and Penza areas, Krasnoyarsk and Krasnodar edges, Stavropol Territory and the Omsk region, the Kemerovo and Chelyabinsk areas and, of course, from all Republic Mordovia were presented. 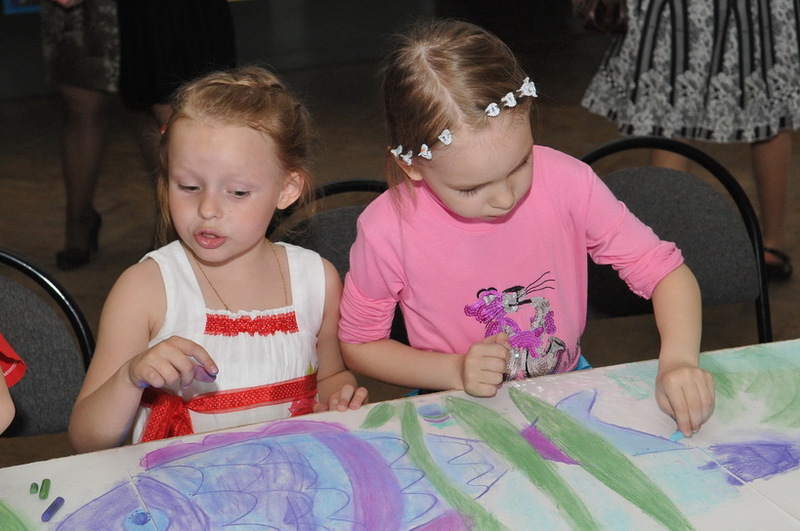 Competition was spent in three nominations: painting and a drawing, a batic, arts and crafts. 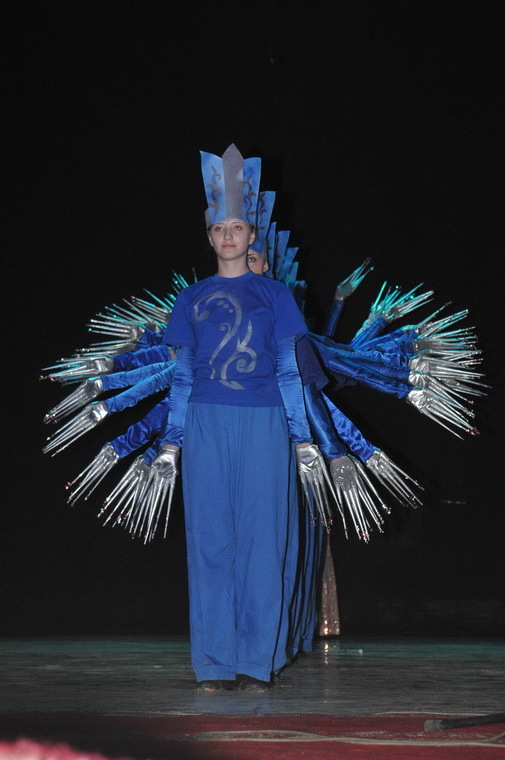 Nomination «Applying Art»: Jahin Ruslan (Resp. Bashkortostan, settlement Chishmy), Dregun Anna ( Urengoj), Buchatsky Alexander (Resp. Mordovia, Saransk), Vorozhejkina Veronica (Resp. Mordovia, Saransk). Winners and prize-winners of festival received memorable prizes and gifts: bright soft toys, modern palms «AquaLung», given by firm "Tetis" and sweets from firm "Lamzur". 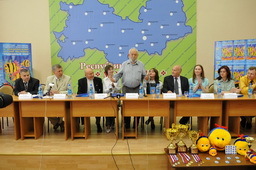 Besides the winners of sport competitions received cups and medals, and prize-winners of creative competitions got laureat badges and nominal certificates. 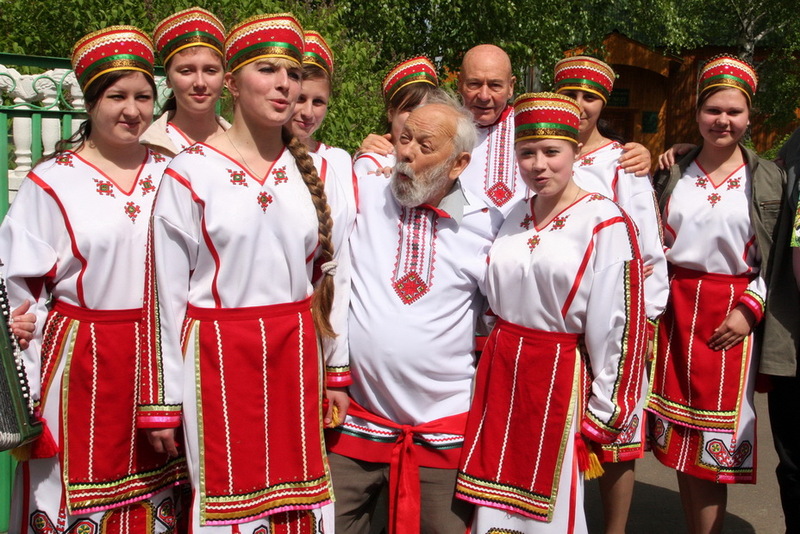 The next, 3rd day, festival has proceeded in Zubovo-Polyansky area of Mordovia. Children welcomed visitors with drawing competition on asphalt. The Mordovian embroidered shirts were presented to Daniel Mercier and Andre Laban.